Michael Oppenheimer, 1990, The Environmental Defense Fund: “By 1995, the greenhouse effect would be desolating the heartlands of North America and Eurasia with horrific drought, causing crop failures and food riots..."(By 1996) The Platte River of Nebraska would be dry, while a continent-wide black blizzard of prairie topsoil will stop traffic on interstates, strip paint from houses and shut down computers...The Mexican police will round up illegal American migrants surging into Mexico seeking work as field hands.” (now a ‘professor’ at Princeton). Now, about our 20-year warming “hiatus.” The climate modelers claim to be baffled by it, but they aren’t. It’s just a 60-year cycle in the Pacific Ocean that periodically warms that vast ocean by about 2 degrees Celsius for 25-30 years. 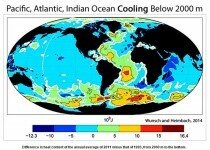 Then the Pacific temperatures drop back to roughly their earlier level for the next 25-30 years. It’s called the Pacific Decadal Oscillation. The record shows PDO warmings at 1860-1880, 1915-1940—and during the “Al Gore” years from 1976-98! Thus we can expect another ten years or so of “hiatus” while the climate models fruitlessly whiz out “new” forecasts. It’s no coincidence that over the past 150 years our newspaper headlines show we’ve had climate scare headlines every 25-30 years—coinciding with the PDO shifts. 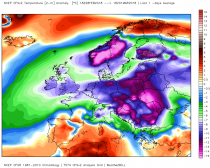 When the trend was cooling, we scared ourselves about another Ice Age. When the trend was warming, we saw forecasts of an “ice-free Arctic” and a huge sea level rise. Nor will the alarmists get to claim runaway warming again after this PDO phase ends about 2030. NASA is now forecasting a deep solar sunspot minimum that could give us 60 years of even lower temperatures than we’ve had during the current 20-year “hiatus.” The temperatures are likely to drop again about 2040. Past solar sunspot minimums like the Maunder and Dalton were famous for causing big famines, but minimums during warmer periods were sometimes missed. 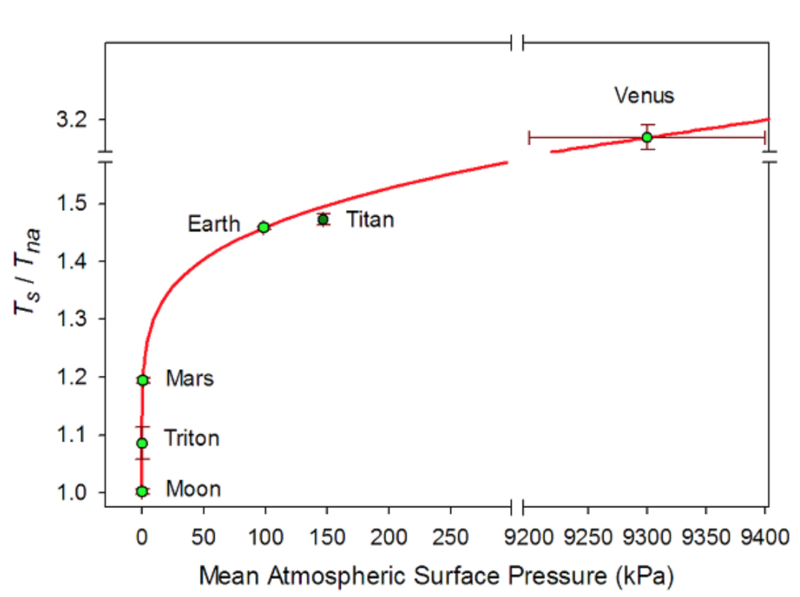 Recent reanalysis shows these minimum come about every 200 years, and the Dalton ended in 1830. Earth will likely get more cloudy - and thus cooler - until the sunspot minimum is over. In complete defiance of the IPCC! Yesterday a major study was released, that concluded that wind turbines cause more atmospheric warming than using coal does! 1: Global Warming: Wind energy results in more warming than Coal does. 2: Climate Change: Wind energy produces more CO2 than Gas or Nuclear does. 3: Ratepayer Cost: Wind energy is 45 times the cost of conventional electrical energy sources. 5: Health: Wind energy can cause severe health consequences to nearby residents. 6: Environmental: Wind energy has multiple major environmental impacts. 7: Jobs: Wind energy is net jobs liability. 8: Fossil Fuels: Wind energy assures a continued reliance on fossil fuels. 9: Sustainability: Wind energy has major dependence on unsustainable components (e.g. rare earths). 10: National Security: Wind energy can adversely affect the missions and operational readiness of military facilities, undermining our national security. When we objectively look at the Big Picture, it is quite clear that there are no NET benefits from using wind energy. How did we go down such a losing path? Because our energy policies were written by special-interest lobbyists, and these policies were NOT based on real Science. Note 1: We recommend reading the Newsletter on your computer, not your phone. Some documents (e.g. PDFs) are easier to read on a computer. We’ve tried to use common fonts, etc to minimize issues. Note 2: Our intention is to put some balance into what most people see from the mainstream media about energy and environmental issues… As always, please pass this on to open-minded citizens, and on your social media sites. If there are others who you think would benefit from being on our energy & environmental email list, please let me know. If at any time you’d like to be taken off this list, simply send me an email saying that. Note 3: This Newsletter is intended to supplement the material on our website, WiseEnergy.org. The most important page there is the Key Documents page. Note 4: I am not an attorney, so no material appearing in any of the Newsletters (or our WiseEnergy.org website) should be construed as giving legal advice. My recommendation has always been: consult a competent attorney when you are involved with legal issues. Two weeks of climate talks in Bonn ended last week without agreement on a draft negotiating text, the Washington Post reports. Developing countries demanded to know when the US$100-billion package promised to them as part of the Paris climate agreement would be forthcoming. Hopefully, the answer will be “never” and that will lead to the end of the deal. Paris is a climate fairy tale. It has always been more about money and politics than the environment. Last year, U.S. President Donald Trump wisely announced that America would withdraw. For developed nations who still believe Paris is a viable plan, the prospect of a massive transfer of wealth under the guise of carbon reductions must seem less attractive without the U.S. to help foot the bill. Still, other world leaders seem irrationally committed to pursuing the real objectives of Paris: wealth redistribution, virtue signalling and globalist governance. At the core of Paris, signed in 2015, and its 1992 umbrella document, the United Nations Framework Convention on Climate Change, is the principle of “common but differentiated responsibilities and respective capabilities.” The term means that developed countries are expected to go first, do more, and pay more. “To each according to his needs, from each according to his abilities,” as Marx wrote in a similar vein. The objective is to rebalance resources. How much more must developed countries do and how many more dollars should they transfer? In the Paris negotiations, the parties confirmed a breathtaking minimum transfer of US$100 billion per year starting in 2020, with the expectation that higher amounts would be forthcoming as time progressed. In exchange, developing countries with high and accelerating carbon emissions, such as China and India, talked of reducing emissions, eventually, probably. At the time the UNFCCC was adopted in 1992, the greater share of global emissions did indeed come from wealthier countries. However, that has not been the case since approximately 2007 and annual emissions from developing countries now dwarf those from the developed world. China became the world’s largest carbon emitter in 2006 and by some estimates emits twice what the U.S. does annually. Yet under Paris, China has said its annual emissions will keep growing until 2030. As a matter of arithmetic, the lifestyles of people in Western countries do not pose nearly as acute a risk to greenhouse gas concentrations as even a small rise in per capita emissions from countries with “emerging” economies and enormous populations. The Paris consensus blames the West for the world’s problems while privileging countries that pose the most serious threats. If the danger is carbon emissions, it is developing countries that are now the biggest problem. Paris is more a movement than a legal framework. It imagines the world as a global community working in solidarity on a common problem, making sacrifices in the common good, reducing inequality and transcending the negative effects of market forces. In this fable, climate change is a catalyst for revolution. It is the monster created by capitalism that will turn on its creator and bring the market system to the end of its natural life. A new social order will emerge in which market value no longer determines economic decisions. Governments will exercise influence over economic behavior by imposing “market-based mechanisms” such as carbon taxes and cap-and-trade systems. Enlightened leaders will direct energy use based upon social justice values and community needs. An international culture will unite peoples in a cause that transcends their national interests, giving way to the next stage of human society. Between the lines of the formal text, the Paris agreement reads like a socialist nightmare. The regime attempts to establish an escalating global norm that requires continual updating, planning and negotiation. To adhere, governments are to supervise, regulate and tax the energy use and behavior of their citizens (for example, the Trudeau government’s insistence that all provinces impose a carbon tax or the equivalent, to escalate over time.) Yet for all of the domestic action it legitimizes, Paris does not actually require it. Like the US$100-billion pledge, reduction targets are outside the formal Paris agreement. They are voluntary; neither binding nor enforceable. Other countries have condemned Trump’s withdrawal and reaffirmed their commitment to Paris but many of them, including Canada, are not on track to meet even their initial promises. Global emissions are rising again. If human action is not causing the climate to change, Paris is irrelevant. If it is, then Paris is an obstacle to actual solutions. If there is a crisis, it will be solved when someone develops a low-carbon energy source as useful and cheap as fossil fuels. A transition will then occur without government interventions and international declarations. Until then, Paris will fix nothing. It serves interests that have little to do with atmospheric concentrations of greenhouse gases. Will America’s repudiation result in its eventual demise? One can hope. Bruce Pardy is Professor of Law at Queen’s University. This column is based upon an article forthcoming in the Journal of Environmental Law and Practice. 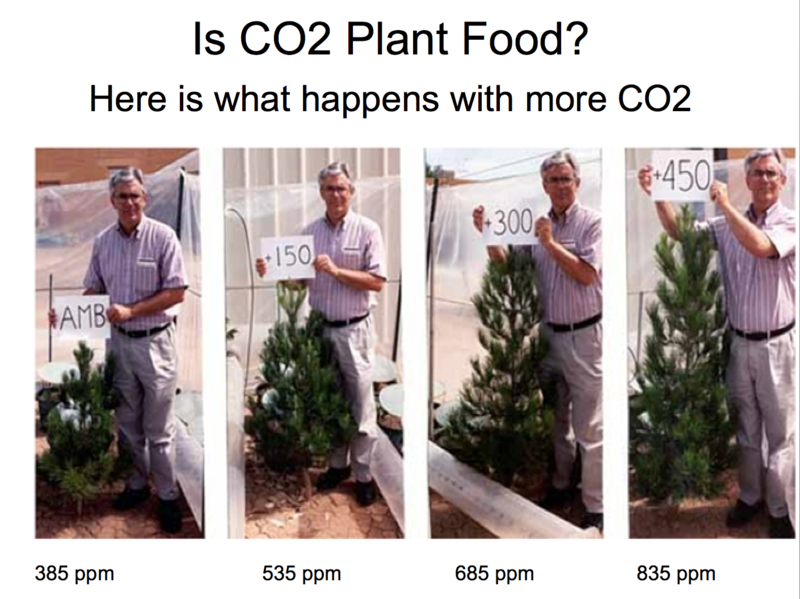 More CO2 makes plants grow faster and with less stress. 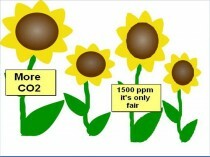 More CO2 stimulates growth of beneficial bacteria in both soil and water. 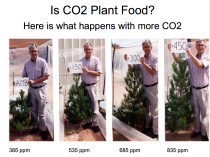 CO2 fertilization, leading to more plant growth, means less erosion of topsoil. 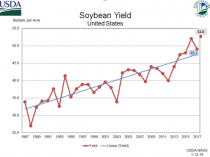 More CO2 means bigger crop yields, and more and bigger flowers. More CO2 fosters glomalin, a beneficial protein created by root fungi. More CO2 helps plants to create natural repellants to fight insect predators. Shaking off skepticism from the outside world that it could succeed amid initial growing pains, the Weather Channel quickly became one of America’s most beloved cable networks and, indeed, the most-watched source for weather news. D’Aleo generously took the time to respond to my questions about the book effort and the Weather Channel’s beginnings. His answers were lightly edited for length and format. Tell us about the motivation for writing the book and its intended audience. John Coleman and I and a number of the original Weather Channel pioneers decided to tell the story of what it took to revolutionize the way weather information was disseminated to the nation, to tell the story of how the Weather Channel was started. We wanted to write the book before time silenced many of us. John passed away a few months after the writing began. Many of the pioneers contributed their own experiences of working those early days, and this makes the book an entertaining and informative history, “the inside story” behind the founding of one of the country’s favorite cable channels. John Coleman is often credited as the Weather Channel’s founder, with funding support provided by Frank Batten Sr. and Landmark Communications. I understand you played a pivotal role in the channel’s launch, as well. Can you briefly walk us through who the key players were in getting the Weather Channel off the ground? John Coleman first told me about his dream of a 24/7 cable weather network when I was working as a vacation fill-in weather producer for his weather shows for “Good Morning America” in the hot summer of 1980. Like a moth to a flame, I was drawn to follow him. My family and I left my home in beautiful Vermont to work with John full time on “Good Morning America” out of the WLS studio in Chicago. John was a veritable meteorological broadcaster rock star. He worked magic with green screen technology [in which maps are electronically added to the image behind the broadcaster], pulling weather maps out of the air on WLS and “Good Morning America” - in a world mostly still using magnetic maps. He was winning awards for his on-air weather presentations in the early 1980s. After Frank recovered, they set up new venture groups to explore alternatives. One of the members was in a poker game with John Coleman, and when John told him about his weather programming idea, he brought him to Landmark. They quickly worked out a deal, and we were off and running. That’s when it got crazy. We were off to Atlanta in October 1981. John and I were very busy defining the product with the artists and producers. We got busy hiring. Resumes and [audition] tapes poured in during December and January. We hired many over the phone. The pioneers reported for orientation March 1, we started practicing in April and launched May 2, 1982. At start-up, amazingly we had 58 full-time broadcasters and forecasters with 66 college degrees and 450 years of meteorological experience. When the Weather Channel launched, what was the level of confidence it would succeed? Though there were doubters, we were confident internally we would be meeting our viewers’ needs and would succeed. A National Weather Service survey indicated that TV was the main source of local weather information. This was true despite the fact that a typical station or network only devoted 15 to 18 minutes on an average broadcast day to weather coverage. We had major challenges, though - the biggest was providing the local information that the viewers needed. Our technical staff worked furiously to be able to deliver the local weather, local forecasts and all severe weather messages. 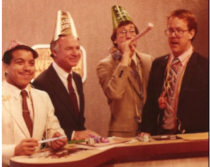 What was the workplace culture like at the Weather Channel in its early days? What was a typical day like for you? The workplace chemistry was generally very good, considering the fact that everyone had very significant workload responsibilities. It was just the start of the computer graphics revolution in broadcasting, and we led the way with more than half a dozen such graphics systems. Our artists, who originally did some graphics or art on paper that was then captured by cameras, quickly transitioned to using pen and palette. All graphics were funneled through a unique frame storage system. The biggest stressor for the “company” was financial. We had fixed costs to run the business. Despite very good ratings, viewer loyalty and increasing advertising sales, it wasn’t until the growing cable industry committed to providing subscriber fees that we turned the corner and became very profitable. What are some of the book’s highlights and key messages that a reader will take away? What should a reader who obtains a copy look forward to? There are many businesses that have been hugely successful by changing the paradigm and meeting needs in a new way, and the Weather Channel was one of those. It takes vision, teamwork and full commitment. The “Weather Channel Pioneers” book tells one such story from one man’s vision that became a shared vision of an incredible and dedicated team and then a full commitment and follow-through by the entire staff to achieve success. There are amusing anecdotes from the early days as we were breaking new ground the reader will enjoy. We know John Coleman tragically passed away before this book was published. Can you briefly talk about his contributions to the book effort? [When I last saw John in 2017], his health was declining, and I decided, after discussions with some of my closest Weather Channel pioneer friends, that we needed to do that book that captures our story now. We were pleased when John agreed. John wrote his entire section and did some editing on the early versions before the combination of this season’s nasty flu and his emphysema sadly took him from us. What is your impression of the Weather Channel as a network today? Do you watch it? Do you feel like it is fulfilling your early visions? What might you change about it to make it better? I watch little television, keeping myself busy with seven-days-per-week forecasting for WeatherBELL Analytics, along with my compadre Joe Bastardi and our other great staff. The Weather Channel realized years ago that the Internet and mobile technology would cut into ratings and focused more of their energies on those areas. That was the right move. New website describes the book. With videos and excerpts. It features a spoof video by a Pioneer honoring the Pioneers here and gone. The Weather Channel turns 36 years old May 2nd. Millions of viewers have watched The Weather Channel over the years. You are probably one of them. Have you ever wondered how the channel came about and what it took to become one of the most successful and well-recognized names in cable. 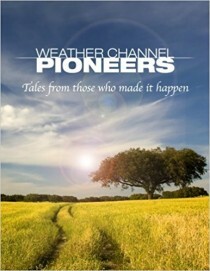 The Founders and doers of the early days have written a book called Weather Channel Pioneers, which answers those questions. In the book, the Pioneers tell that story. http://Weatherchannepioneers.com is the web page that tells you more and links to the Amazon site where you can purchase the book. There are soft copy and e-book versions with over 120 pictures. We dedicated it to john Coleman who sadly passed away late this winter. If you prefer the ebook, go here. Thanks to my friend Anthony for being one of the early reviewers and his kind words. Ironically the day the book was released, The Weather Channel was sold again. The book has many amusing anecdotes and untold stories by the ‘Weather Channel Pioneers in their own words along with many photos. Those of you who enjoyed TWC years ago will see people you will remember. We invite you to step back in time and experience what it was like to make that dream a success and imagine sharing in that adventure. I had a hand in the early TWC success. I’ll never forget the first time I saw TWC. It was at the county fair at the business pavilion, and a local company was selling “satellite TV”. They had their display tuned to “The Weather Channel” and I must have stood there a full 30 minutes watching it. I was mesmerized. I knew then I wanted to be a part of it somehow, and later, my own dream came true when I provided equipment to initially get WSI satellite images into their Quantel still store (which handled the on-air sequences) and later via an IBM PC, which had the very first PC based computer frame-buffer graphics card with a Genlock capable (used to synchronize to the other TV devices) RGB to NTSC encoder to make composite video and keep it synchronized with the other video devices in the studio. It’s something that I was thrilled to design. 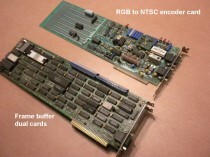 Note the “breadboarding area” on the top card. The reason was that some video switchers (like models from Grass Valley Group) had a specific requirement for horizontal blanking width, which sometimes differed based on the setup at the TV studio. In the digital to analog world, sometimes I’d have to design analog circuitry “on the fly” to compensate for these nuances so that when this device was switched to while in the chroma-key, there wasn’t a slight horizontal tick, but a seamless transition. Back then, making NTSC television work reliably was a bit of an art-form. What TWC did back then and the demands they made, changed the way the NWS did business with the public - and for the better. I was honored to be working with the TWC team back then, and while I would have loved to be on-air, circumstances at the time just didn’t mesh. But I did gain two life-long friends; Joe D’Aleo and John Coleman, who joined me in the fight against the often ridiculous climate change arguments we fight here daily. This book is dedicated to the pioneers. It’s a profile in vision, innovation, and courage. I highly recommend it. Note: Buy Joe Bastardi’s The Climate Chronicles in the same order and get free shipping even if you are not on Amazon Premium. Trump announces he will pull out of Paris Climate Accord. President blasts the agreement as ‘unfair at the very highest levels’. 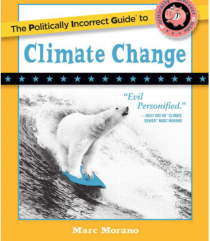 Marc Morano’s “Politically Incorrect Guide to Climate Change” uses humor to battle alarmists. See story here. The Beast form the East - Siberian cold brought up the 3 feet of snow to the UK (drifts topping 8 feet near Dublin, Ireland). See even the NYT could not ignore this. This winter featured snow in North Africa where alarmists predicted warmth and expanding drought and desert. Instead colder temperatures and increasing precipitation and shrinking desert has been observed. The National Oceanic and Atmospheric Administration (NOAA) has yet again been caught exaggerating ‘global warming’ by fiddling with the raw temperature data. This time, that data concerns the recent record-breaking cold across the northeastern U.S. which NOAA is trying to erase from history. Here is NOAA’s January 2018 chart for Northeast U.S. - an area which includes New England along with NY, PA, NJ, DE and MD. That’s because, as Paul Homewood has discovered, NOAA has been cooking the books. Yet again - presumably for reasons more to do with ideology than meteorology - NOAA has adjusted past temperatures to look colder than they were and recent temperatures to look warmer than they were. The cold weather really began on Jan 2nd, when an Arctic front descended across much of the country, and extended well into March. The winter of 2013-14 finished as one of the coldest winters in recent memory for New York State. Snowfall across Western and North Central New York was above normal for many areas, and in some locations well above normal. This winter comes on the heels of two previous mild winters, making the cold and snow this winter feel that much harsher. Relentless cold continued through the month of January across the region. So why, he wondered, did NOAA have this marked down as only the 30th coldest winter (since 1895) on its New York State charts, with a mean temperature of 16.9F? 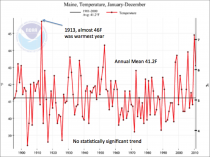 Homewood compared the local records for January 1943 and January 2014 - months which, according to NOAA’s charts, had very similar average temperatures. 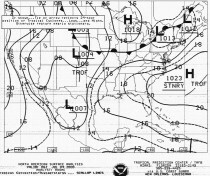 What he found was that NOAA’s charts were deeply inaccurate. 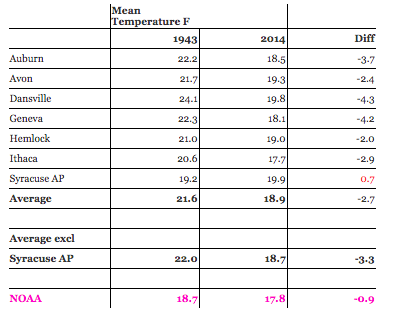 The 2014 local temperatures had been adjusted upwards by NOAA and the 1943 local temperatures downwards. 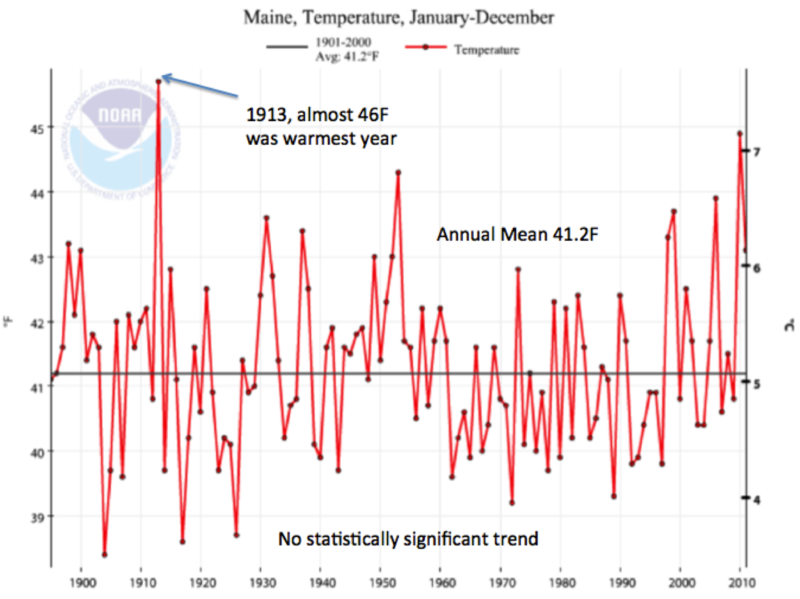 On average the mean temperatures in Jan 2014 were 2.7F less than in 1943. Yet, according to NOAA, the difference was only 0.9F. Somehow, NOAA has adjusted past temperatures down, relatively, by 1.8F. Now, Homewood has given the same treatment to the most recent Big Freeze - the winter of 2017/2018. Yet again, he has found that NOAA’s arbitrary adjustments tell a lie. They claim that January 2018 was warmer in the New York region than January 1943, when the raw data from local stations tells us this just isn’t true. So at the three sites of Ithaca, Auburn and Geneva, we find that January 2018 was colder than January 1943 by 1.0, 1.7 and 1.3F respectively. Yet NOAA say that the division was 2.1F warmer last month. NOAA’s figure makes last month at least 3.1F warmer in comparison with 1943 than the actual station data warrants. Clearly NOAA’s highly homogenized and adjusted version of the Central Lakes temperature record bears no resemblance at all the the actual station data. And if this one division is so badly in error, what confidence can there be that the rest of the US is any better? Well indeed. The key point here is that while NOAA frequently makes these adjustments to the raw data, it has never offered a convincing explanation as to why they are necessary. Nor yet, how exactly their adjusted data provides a more accurate version of the truth than the original data. One excuse NOAA’s apologists make is that weather stations are subject to changing environmental conditions. For example, when the station sited at Syracuse in 1929 was located at what was originally just a sparse aerodrome. Since then, however, as Homewood notes, it has grown into a large international airport with two runways servicing two million passengers a year. Its weather station readings therefore will certainly have been corrupted by the Urban Heat Island effect: that is, its temperature readings will have been artificially elevated by the warmth from the surrounding development and aircraft engines. So you’d think, wouldn’t you, that to compensate for this NOAA would adjust the recent temperatures downwards. Instead, for no obvious reasons, it has adjusted them upwards. This is a scandal. NOAA’s climate gatekeepers are political activists not honest scientists and the U.S. taxpayer has no business funding their propaganda. 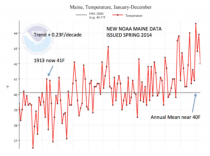 Recall the story we posted a few years ago about NOAA shenanigans in Maine. The original USHCN data set was downloaded in 2011 for a presentation. It showed no statistically significant trend (slightly negative) since 1895. When asked to reprise the presentation a few years later, we update the chart from Climate at a Glance and found a very large -2.3F/decade warming accomplished by cooling the past. 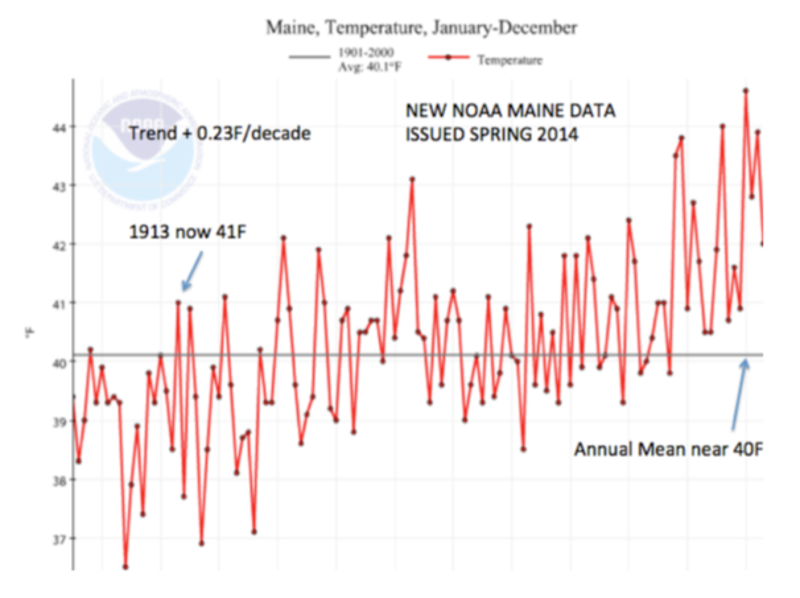 The local newspaper (Portland Press Herald) did a story on how Maine was warming faster than any other state. When President Trump calls the alarm surrounding climate change a hoax, he is fundamentally correct: there is no valid scientific basis for climate alarm. 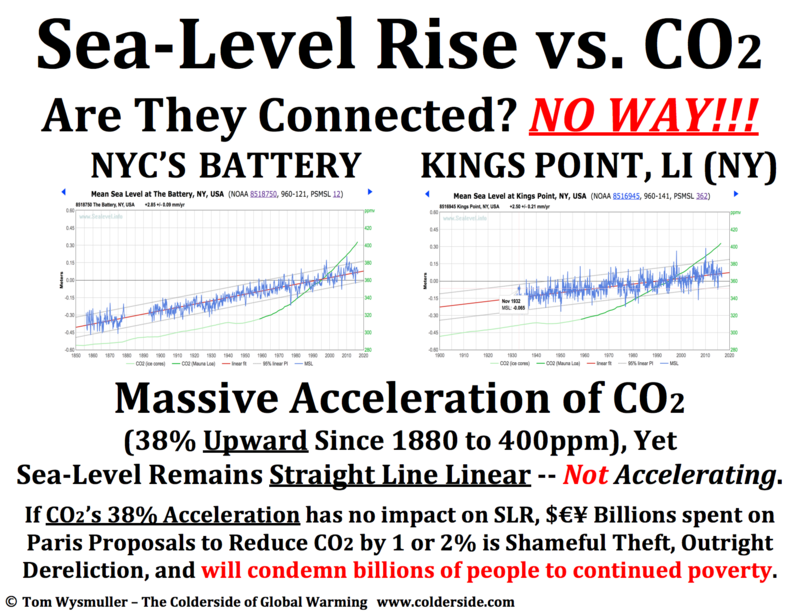 Climate alarmism is made possible by equal parts data manipulation and worthless climate models. Now that Congress and the president are done with tax reform, many expect spending cuts and debt reduction to be up next. Given the huge and still increasing economic costs being imposed on the nation for no scientifically valid reason, we suggest a renewed focus on rapidly eliminating destructive carbon dioxide emission regulations. For those not familiar, in December 2009 the Obama administration issued a report (the EF) that claimed to find atmospheric greenhouse gases (GHG) pose a “danger” to human health and welfare. Despite President Trump’s statement that climate alarm is a “hoax,” nearly everyone Pruitt talks to - holdover officials at EPA, legions of academics receiving government funding, lobbying organizations like the Chamber of Commerce and National Association of Manufacturers, and even many energy industry executives - tells him that reconsidering the EF is a huge mistake because the scientific evidence supporting it is overwhelming. Pruitt has proposed a year long, perhaps televised, Red/Blue debate to clarify the scientific situation. But before this lengthy process has even started, environmental groups and blue state AGs are already pummeling EPA in court with its own EF, winning victories that obstruct the administration’s efforts to grow America’s energy sector, and to enhance its economic and national security. So, what is the actual science behind the EF? We confidently assert that in any Red/Blue evaluation of the science, where the Blue team supports the EF, the Blue team will lose badly. 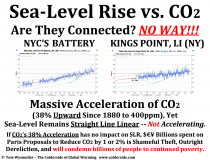 “Warmists” claim a 97% scientific consensus regarding the hypothesized catastrophic impact of increased atmospheric concentrations of CO2 and other GHGs. 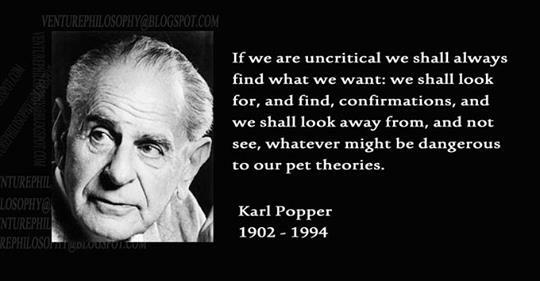 But this illusion of consensus has only come about through misrepresentation of global temperatures and research results plus rigid enforcement of orthodoxy and refusal to debate for some two decades. In accordance with the scientific method, the EF has been shown to be invalid at least three separate times over the past two years. One of us (Wallace) is the lead author of three scientific research reports that, each in a unique fashion, invalidated all of the lines of evidence on which EPA claimed to rely for its EF. All three of these reports meet two criteria fundamental to the scientific method: (1) the authors’ mathematical/statistical modeling work can be easily replicated since the model results are shown, and all of the data utilized are stated in the research reports to be available from one of the authors; and (2) extensive peer review, with the distinguished, highly credentialed reviewers being publicly identified. By contrast, the vast majority of the work on which EPA relied for the EF does not meet these two criteria, and therefore would be excluded from consideration in a scientifically proper reconsideration. Most important, our findings have never been invalidated by the massive climate alarm community. As an illustration of the relevance of these findings, our June 2017 Research Report sought to validate the estimates of current and historical global average surface temperature (GAST) from NOAA, NASA, and the UK’s Hadley CRU, using the best available empirical data. These official GAST estimates are a necessary foundation for EPA’s “lines of evidence” for its EF and are also the foundation for frequent government claims of record-setting temperatures. But this research found it impossible to conclude from the three GAST data sets that recent years have been the warmest ever. Instead, the conclusive findings were that the GAST data sets are simply not a valid representation of reality. More specifically, in this research report, past changes in the previously officially reported historical data are quantified. 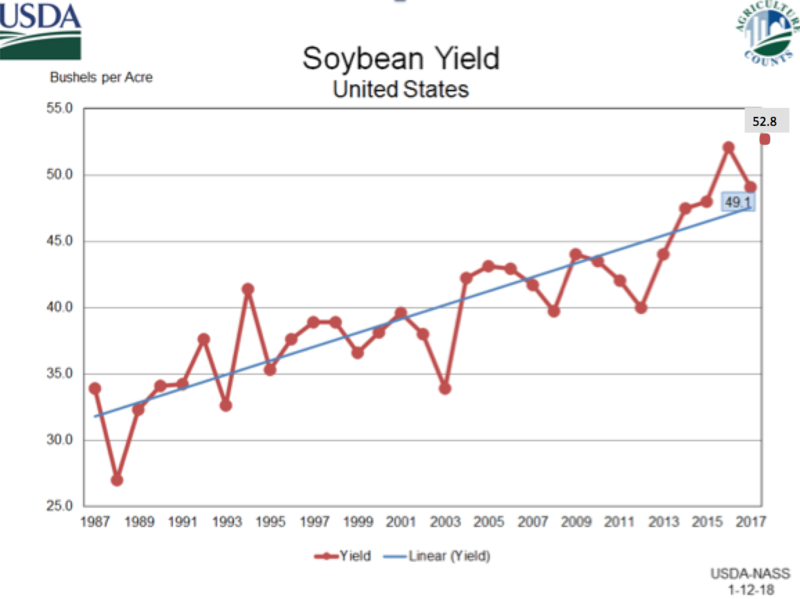 It was found that each new version of GAST has nearly always exhibited a steeper warming linear trend over its entire history. And, it was nearly always accomplished by each entity systematically removing the previously existing cyclical temperature pattern. This was true for all three entities providing GAST data measurement, NOAA, NASA and Hadley CRU. 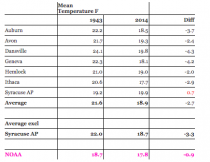 Given the magnitude of each of the three entities’ historical data adjustments, and their removal of the previous officially-reported cyclical temperature patterns, the officially-reported data are now totally inconsistent with very considerable current, published and credible U.S and other temperature data. 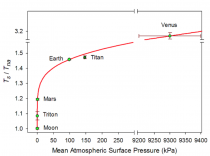 For there to be a real global warming crisis, it is necessary that rising atmospheric GHG concentrations be proven to have a statistically significant impact on GAST. Collateral claims of danger from things like extreme weather events, droughts, floods, hurricanes and rising seas are fundamentally based on proof of that impact. But that proof has not been made. The regulations based on the EF that President Obama imposed (e.g., the Clean Power Plan) cause huge and totally unnecessary costs to the economy in the range of hundreds of billions of dollars per year. Given the vast economic costs to America of pursuing the suppression of fossil fuels, it makes no sense to insert a further one-year plus Red/Blue debate delay in granting reconsideration of the EF. Instead, the Red/Blue exercise should be held as a prompt, on-the-record legal reconsideration of the EF. When this exercise is over, the American people finally will have been shown the truth about the shoddy, tendentious, and unscientific mangling of data that’s necessary to sustain the cult of climate alarm. Wallace, Ph.D., is the lead author of numerous papers and legal briefs regarding EPA’s Endangerment Finding. Menton is a lawyer who has submitted a petition calling on EPA to reopen its Endangerment Finding.